The 141st Westminster Dog Show just took place in New York City. Along with an extensive judging to determine which dog is Best in Show, agility and obedience competitions also took place to showcase the dogs' true talents. A Bichon Frises is seen in the benching area during Day One of competition at the Westminster Kennel Club 141st Annual Dog Show in New York on February 13, 2017 . A Cavalier King Charles Spaniel is seen in the benching area during Day One of competition at the Westminster Kennel Club 141st Annual Dog Show in New York on February 13, 2017 . A Bichon Frise is groomed backstage at the 141st Westminster Kennel Club Dog Show, February 13, 2017 in New York City. There are 2874 dogs entered in this show with a total entry of 2908 in 200 different breeds or varieties, including 23 obedience entries. A Chow Chow is seen in the benching area during Day One of competition at the Westminster Kennel Club 141st Annual Dog Show in New York on February 13, 2017 . A Bulldog is seen in the benching area during Day One of competition at the Westminster Kennel Club 141st Annual Dog Show in New York on February 13, 2017 . An Old English Sheepdog is seen in the benching area during Day One of competition at the Westminster Kennel Club 141st Annual Dog Show in New York on February 13, 2017 . A Pembroke Welsh Corgi waits to compete at the 141st Westminster Kennel Club Dog Show, February 13, 2017 in New York City. There are 2874 dogs entered in this show with a total entry of 2908 in 200 different breeds or varieties, including 23 obedience entries. A Standard Poodle competes at the 141st Westminster Kennel Club Dog Show, February 13, 2017 in New York City. There are 2874 dogs entered in this show with a total entry of 2908 in 200 different breeds or varieties, including 23 obedience entries. An Italian Greyhound competes during the 141st Westminster Kennel Club Dog Show, February 13, 2017 in New York City. There are 2874 dogs entered in this show with a total entry of 2908 in 200 different breeds or varieties, including 23 obedience entries. A French Bulldog runs during competition at the 141st Westminster Kennel Club Dog Show, February 13, 2017 in New York City. There are 2874 dogs entered in this show with a total entry of 2908 in 200 different breeds or varieties, including 23 obedience entries. A Yorkshire Terrier runs during competition at the 141st Westminster Kennel Club Dog Show, February 13, 2017 in New York City. There are 2874 dogs entered in this show with a total entry of 2908 in 200 different breeds or varieties, including 23 obedience entries. A bulldog rests before competing at the 141st Westminster Kennel Club Dog Show, February 13, 2017 in New York City. There are 2874 dogs entered in this show with a total entry of 2908 in 200 different breeds or varieties, including 23 obedience entries. Italian Greyhounds compete during the 141st Westminster Kennel Club Dog Show, February 13, 2017 in New York City. There are 2874 dogs entered in this show with a total entry of 2908 in 200 different breeds or varieties, including 23 obedience entries. A Toy Poodle is groomed backstage before competing at the 141st Westminster Kennel Club Dog Show, February 13, 2017 in New York City. There are 2874 dogs entered in this show with a total entry of 2908 in 200 different breeds or varieties, including 23 obedience entries. Borzoi dogs prepare to take the field to compete at the 141st Westminster Kennel Club Dog Show, February 13, 2017 in New York City. There are 2874 dogs entered in this show with a total entry of 2908 in 200 different breeds or varieties, including 23 obedience entries. Maltese dogs prepare to take the field for competition at the 141st Westminster Kennel Club Dog Show, February 13, 2017 in New York City. There are 2874 dogs entered in this show with a total entry of 2908 in 200 different breeds or varieties, including 23 obedience entries. A Lhasa Apso is seen in the Benching Area area during Day One of competition at the Westminster Kennel Club 141st Annual Dog Show in New York on February 13, 2017. A group of Pembroke Welsh Corgis wait to compete at the 141st Westminster Kennel Club Dog Show, February 13, 2017 in New York City. There are 2874 dogs entered in this show with a total entry of 2908 in 200 different breeds or varieties, including 23 obedience entries. 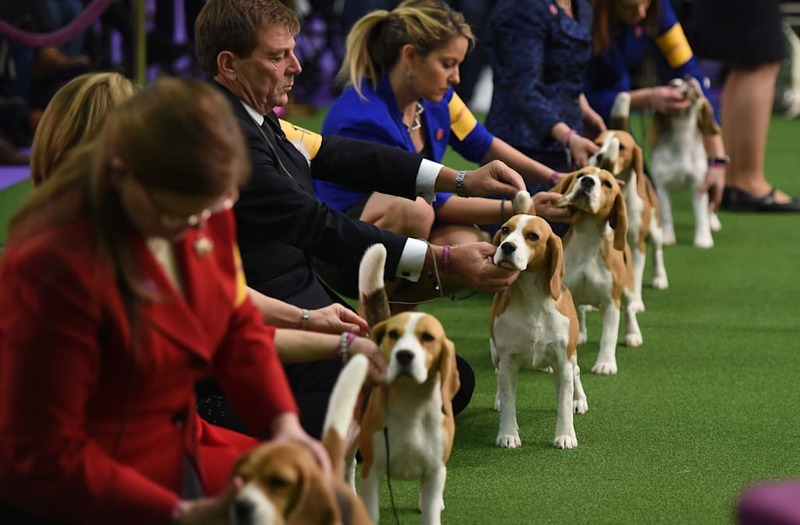 Beagles line up in the judging area during Day One of competition at the Westminster Kennel Club 141st Annual Dog Show in New York on February 13, 2017. A Beaucerons is seen in the judging area during Day One of competition at the Westminster Kennel Club 141st Annual Dog Show in New York on February 13, 2017. A handler is seen with a Dalmatian in the judging ring during Day One of competition at the Westminster Kennel Club 141st Annual Dog Show in New York on February 13, 2017 . Dogs are seen in the benching area during Day One of competition at the Westminster Kennel Club 141st Annual Dog Show in New York on February 13, 2017. A Chinese Crested Powder Puff rests with Kristen Riddley in the benching area during Day One of competition at the Westminster Kennel Club 141st Annual Dog Show in New York on February 13, 2017 . A Beaucerons is seen in the judging area during Day One of competition at the Westminster Kennel Club 141st Annual Dog Show in New York on February 13, 2017 . An Afghan is seen in the benching area during Day One of competition at the Westminster Kennel Club 141st Annual Dog Show in New York on February 13, 2017 . Cavalier King Charles Spaniels are seen in the benching area during Day One of competition at the Westminster Kennel Club 141st Annual Dog Show in New York on February 13, 2017 . A Standard Poodle is seen in the benching area during Day One of competition at the Westminster Kennel Club 141st Annual Dog Show in New York on February 13, 2017 . Half sisters Elsa (2) and Faith (5) represent the South Carolina State dog, the Boykin Spaniel, at the 'Meet the Breed' Day ahead of the 141st Westminster Kennel Club Dog Show, on February 11, 2017 in New York City. Acela, a three year old Papillon from Long Island, NY, waits to take part in the Masters Agility Championships at the 141st Westminster Kennel Club Dog Show, on February 11, 2017 in New York City. 11 year old Bergamasco Alpine Sheepdog, D'Artagnan, takes a break during the 'Meet the Breeds' day ahead of the 141st Westminster Kennel Club Dog Show, on February 11, 2017 in New York City. Cessie, a Coton De Tulear from Beverley Hills, California, sits on the shoulders of owner Jessica Macintire after competition at the 141st Westminster Kennel Club Dog Show in New York City, U.S., February 13, 2017. A Boxer is wrapped in a blanket after competition at the 141st Westminster Kennel Club Dog Show in New York City, U.S., February 13, 2017. Sky Guy, an Italian Greyhoud, stands with its handler before competition at the 141st Westminster Kennel Club Dog Show in New York City, U.S., February 13, 2017. Diamond, a Standard Smooth Dachshund wears a coat and jewels before competition at the 141st Westminster Kennel Club Dog Show in New York City, U.S., February 13, 2017. A Standard Poodle is groomed in the benching area by his handler before competition at the 141st Westminster Kennel Club Dog Show in New York City, U.S., February 13, 2017. A Lhasa Apso competes at the 141st Westminster Kennel Club Dog Show, February 13, 2017 in New York City. There are 2874 dogs entered in this show with a total entry of 2908 in 200 different breeds or varieties, including 23 obedience entries. A Yorkshire Terrier rests in the Benching Area during Day One of competition at the Westminster Kennel Club 141st Annual Dog Show in New York on February 13, 2017. The Pulik is seen in the judging area during Day One of competition at the Westminster Kennel Club 141st Annual Dog Show in New York on February 13, 2017. A Maltese sits in the benching area during Day One of competition at the Westminster Kennel Club 141st Annual Dog Show in New York on February 13, 2017. The stakes were high during the Masters Agility Competition on Saturday, where dogs are evaluated based on speed of their run through as well as on how clean the run through was. This is, after all, the Westminster Dog Show, which means the competition is at the highest of levels. Every dog was on his or her A game. And then, there was Mia the distracted beagle. It's clear Mia really wanted to do her best at the agility course, but she also just wanted to be a dog and do dog things. With her floppy ears and cute little tail, you really can't blame her. Even if Mia didn't win the competition, we're pretty sure she won favorite pup for everyone watching. The audience roared with laughter, and cheered loudly when she finished the course. Even the commentators were enthralled, saying, "That was a delightfully entertaining run." You are Best in Show in our book, Mia.